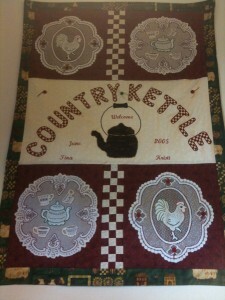 Just north of Madison, Wisconsin is home to the Country Kettle Family Restaurant. Sisters Tina and Kristi opened the diner in June 2005. The pair built their business on an empty field at the intersection on County Road V at I39. While the restaurant was built new, it captures the feel of a 50-60’s era small town diner. The quaint location is a local favorite, known for hand-dipped fried chicken, fish fry and prime rib dinners. The dining area is divided into three areas plus counter service. Wait staff was friendly and helpful and our food came up quickly. Lunch and dinner menus include Burgers and other sandwiches, shrimp, salads. We started with the mozzarella sticks with were served piping hot and golden brown with a side of marinade sauce. this is Wisconsin and cheese curds are also on the menu. Breakfast menu items include pancakes, French toast, eggs, hash browns and more. I tried the soup of the day, creamy vegetarian green bean casserole with carrots for color, Our patty melt and veggie cheeseburger came to our table fast and hot, cooked to order. The fries golden brown with a hint of seasoned salt. The Country Kettle is known for their desserts. We could not leave without tasting the Cherry Crumble pie served warm with two scoops of rich vanilla ice cream. Kristi is known for her custom cakes. One wall is covered with pictures of her whimsical creations. While we dined, we heard another table send their kudos to the kitchen staff for a delicious meal. Near the door is a sign asking “Where are you from?” and maps of the local area and the United States. It was surprising to see pins marking visits from diners from Alaska to Hawaii to Florida.